Tyler Hall, newly-renovated and looking brand new, is located on old campus off of James Blair Drive (building #134 on the Campus Map). On foot: Walk west past the President's House and the Wren Building. 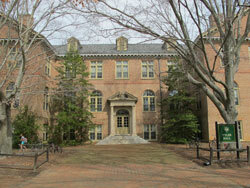 Tyler Hall is the second building on the right past the Wren Building. By car: From College Corner (the V intersection of Jamestown and Richmond Roads), proceed west on Richmond Road to Stadium Drive. Go past the stadium to the Sadler Center and turn left on James Blair Drive. Tucker Hall is the second building on the right. Three airports are convenient to Williamsburg: Richmond International Airport (RIC), Norfolk International Airport (ORF), and Newport News/Williamsburg Airport (PHF). Richmond is about an hour from the College by car and Norfolk is about 90 minutes; Newport News is about 30 minutes. Keep in mind that there is a tunnel between Norfolk and Williamsburg, which can sometimes cause traffic delays. All airports offer shuttle service to Williamsburg and the College.